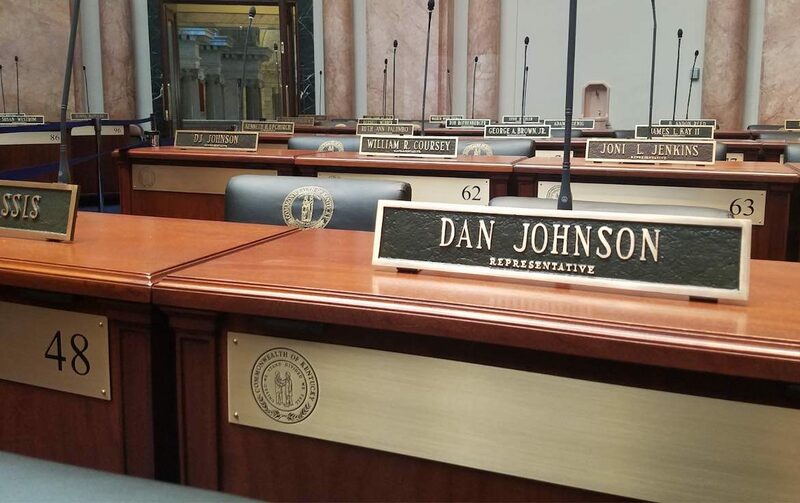 The nameplate of Danny Johnson at Kentucky's state Capitol. The lawmaker committed suicide after the Kentucky Center for Investigative Reporting released a Peabody Award–winning podcast series about him, "The Pope's Long Con." Podcasts are a nearly perfect vehicle for narrative storytelling. The episodic nature, the way each chapter is delivered to the listener’s personal device, the inherent intimacy of audio, advertisers’ interests in reaching a connected audience over several episodes, and the human nature for hearing and sharing stories all make the platform ideal for delivering narratives. But narratives are hard to find in news. We may call everything we file a “story,” but it’s rare that a school board meeting or anything else that happens day in and day out will have the type of beginning-middle-end arc that makes for a great story. And when you’re tasked with reporting the news, but your heart — and the audience — wants narrative … what do you do? You can’t try to put an arc on a story that doesn’t have one — that would change the nature of the story. It’s narrative bias. But it’s unlikely you can just pass on covering stories that don’t have a rising action and resolution. This episode is all about balance. First, consultant Judith Smelser, who has written on narrative bias in public media, talks about dealing with narrative dreams in a daily news world. Great stories and good news coverage are not mutually exclusive, but getting it all done means making some hard choices. And Stephen George of Louisville Public Media talks about The Pope’s Long Con, a short-run podcast series that just won a Peabody. George shares how he knew his team had a story fit for a series and how they got it done without giving up on their local news mission. Please subscribe to The Pub in iTunes or your favorite podcast app and leave us a rating and a comment! That will help boost our search results and allow people to find the show more easily. We welcome your feedback on the show: You can reach me on Twitter; Current’s digital editor, Mike Janssen, is at mike@current.org; and you can contact Current generally at news@current.org or on Twitter. The station already uses the Do502 platform on its websites.